On our recent trip to Oklahoma City, we stayed at the Tower Hotel. We had never stayed here before this trip. It is not a chain hotel, so it is unknown to most people. It appeared that this hotel had recently undergone an ownership change. You could still see the remnants of the old sign on the building. It was formerly a Marriott. 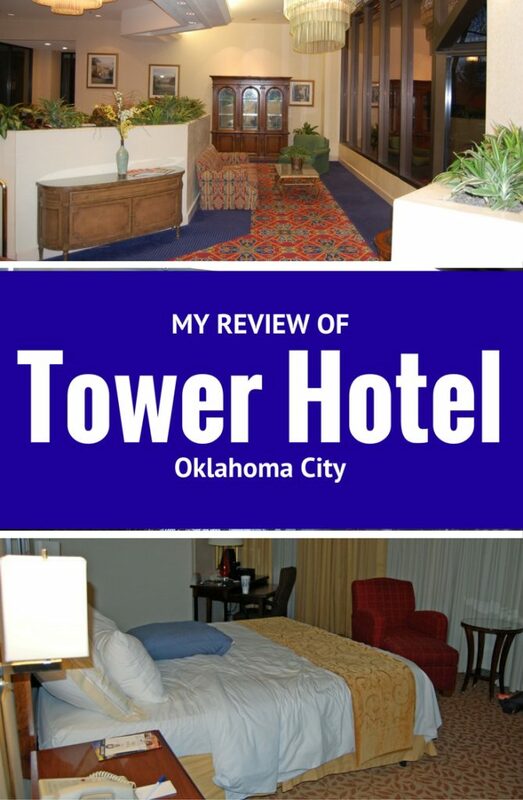 This is my review of Oklahoma City’s Tower Hotel. The Tower Hotel is located on Northwest Expressway, just off of May Avenue. As you can imagine, it is located on the Northwest side of the city. The location is pretty easy to get to. It is only a few miles from the Oklahoma City Zoo, Frontier City theme park, and downtown Oklahoma City. It is also close to Lake Hefner. The hotel is about a 15 minute drive from the Oklahoma City airport. 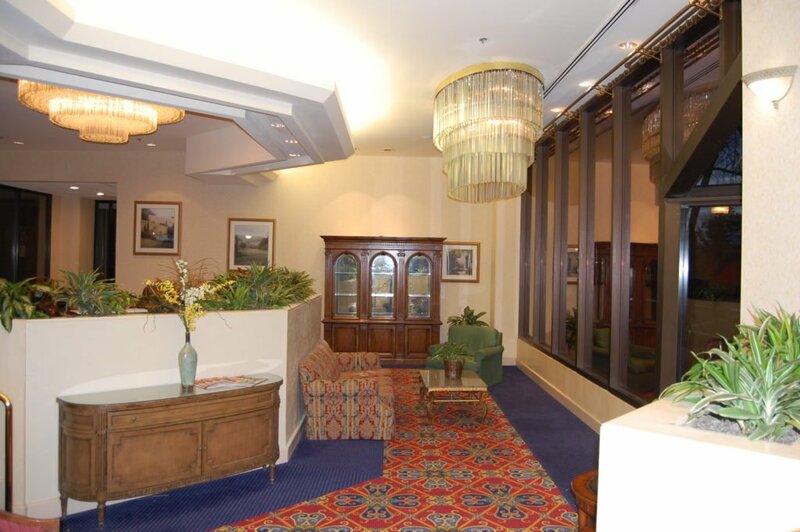 There is nothing really special about the decor of the Tower Hotel. It is about what you would expect of a hotel. Some of the public spaces have marble tile, while others have carpet. The furniture is traditional. While the decor is nice, there is no wow factor to it. You will find the same style of decor in the rooms as you do throughout the public spaces. For me, the decor is one of the downsides of this hotel because it is just so predictable. While the decor in the rooms is nice but boring, the layout of the rooms is a different story. Unlike most hotels, the beds in the rooms face the windows. 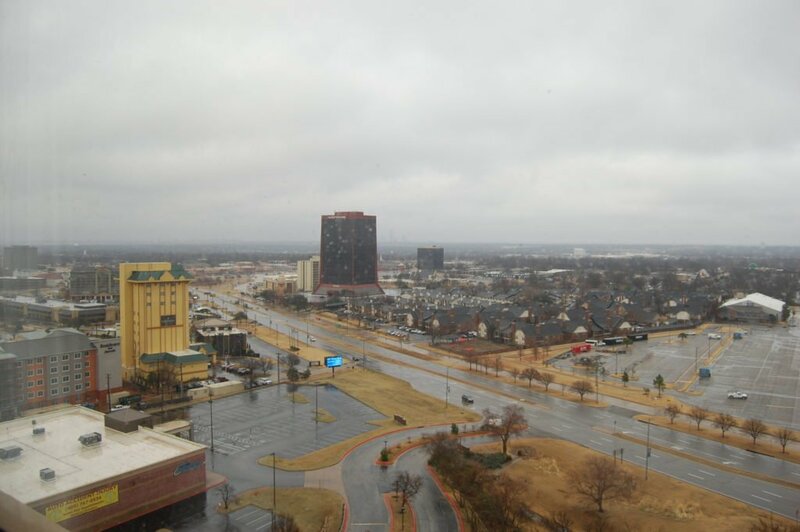 Oklahoma City is not the most beautiful city in America, but the layout of the rooms does allow you to appreciate the view of the city versus staring at a blank wall. With the bed facing the windows, the entertainment center and desk in the rooms are set at an angle across some of the corners to complete the look. There is just as much walk space in the rooms as there is with a more traditional layout. The bathrooms are small. The sink and vanity area is actually separated from the toilet/tub part of the bathroom by a door. This allows one person to be in the shower while another person is brushing their teeth. This is a very user-friendly design. There are some small shelves on the side of the vanity to give you a place to store your toiletries. Additionally, the closet is next to the vanity and has mirrored doors on it. This give you a full-length mirror that most hotel rooms do not have. Each room also has a fridge in it. For some reason, our room was missing the fridge, though. The Tower Hotel does not offer much in terms of dining. The Bistro 44 is only open for breakfast. Russell’s Lounge is a bar that is open on Tuesday through Saturday nights. During our stay here, we ate breakfast at Bistro 44. I was not impressed. The restaurant serves your standard hotel breakfast food, including eggs, fruit, oatmeal, and bagels. They do have made-to-order omelettes. We did not try the omelettes, but did sample most of the other foods. I did not think the food was very good. The bagels and biscuits were stale. The apple juice tasted funny. I would recommend finding a nearby restaurant to eat at if you stay at this hotel. The Tower Hotel has a fitness center and an indoor/outdoor swimming pool. We were there in January, and it was too cold to swim outside. They had the outdoor portion of the pool closed off. The indoor portion was open and heated though. Boston and my niece enjoyed swimming. The hotel also offers fresh brewed coffee in the lobby, wi-fi throughout the hotel, and conference meeting rooms. Again, other than the pool, I was not blown away by the amenities they offered. Normally, I am not one to notice maintenance problems unless they are glaring. However, on this trip, we were missing the fridge from our room. While sitting in the lobby, we overheard the front desk calling maintenance to tell them about a stuck elevator on the 5th floor. Also, the hotel’s thermostat was not working properly. On one end of the hotel, the temperature was very comfortable, while on the other end, it was extremely hot. Our room was on the end of the hotel that was hot. We turned the thermostat in our room down as low as it would go, and it still would not cool off. So, either they need to hire better maintenance staff or they need to spend some money to make some upgrades. The Tower Hotel is pretty reasonably priced. 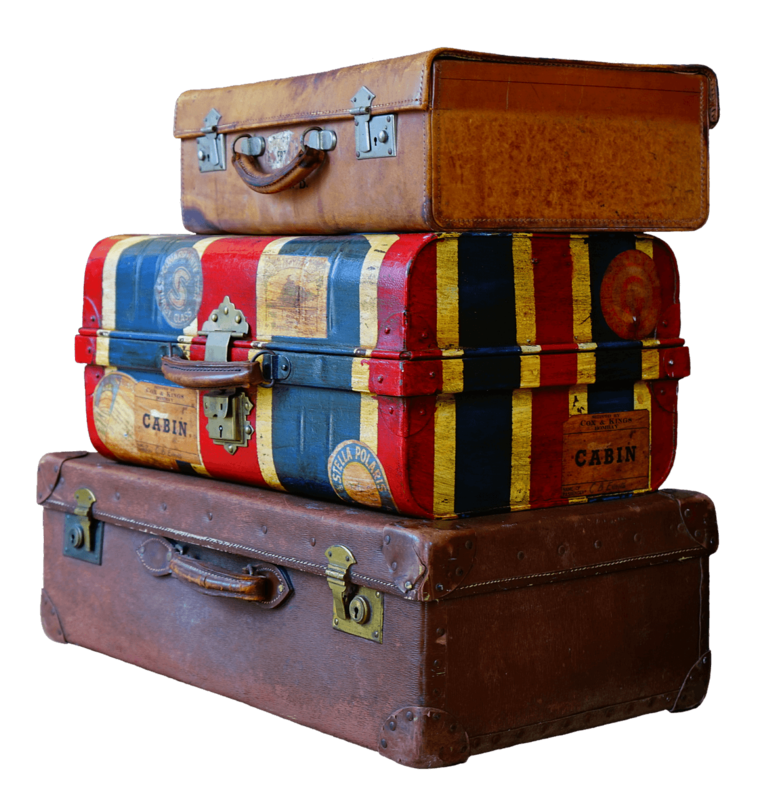 Depending on the time of your stay and the package/deal you have, you can expect to pay anywhere from $70-150 per night. While I would not be happy about paying the upper end of this range, I do feel that the lower end of the price range is a fair price given all of the positives and negatives of this hotel. You can definitely find better hotels, but you can also find much worse for the same price. 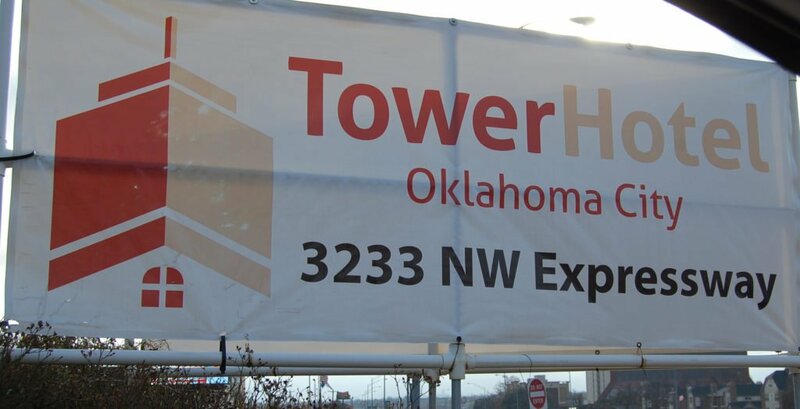 We recently stayed at the Tower Hotel in Oklahoma City during a weekend visit with my family. I liked the layout of the rooms. 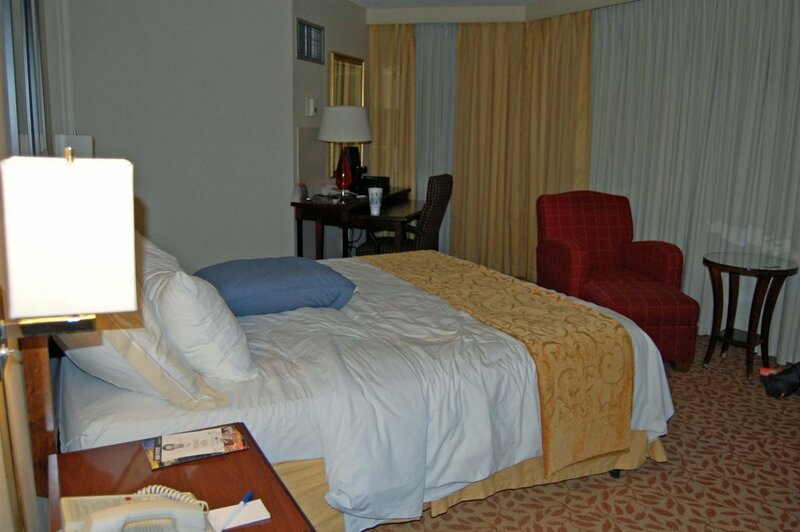 The location of the hotel is very convenient to most things that you would want to do in Oklahoma City. However, the dining is not good and the hotel has some maintenance issues that need to be addressed. The decor of the hotel was nice but I found it to be boring and predictable. All in all, this is a good place to stay if you are looking for a relatively cheap place to sleep and shower while in the city. If you are looking for a luxurious resort to veg out in it, then I would recommend finding a different hotel. I hope this review of OKC’s Tower Hotel was helpful. Happy travels!